Bradford prides itself on its programming of shorts. I’m not really a shorts fan and I do tend to neglect them, though I appreciate the importance of short filmmaking in the ecology of film production generally. BIFF 2014 featured short films in a variety of programming slots. The ‘Shine Short Film Competition’ comprised six films shown as a programme twice and individual entries shown before the main feature elsewhere in the programme. I saw only two of the six, one of which, Cadet (Belgium 2013) won the prize (report to follow). I didn’t see any of the Sydney Underground Shorts which screened before the late night horror films in the ‘Bradford After Dark’ programme. (I couldn’t watch the late-night films as there is no all-night public transport to get me the nine miles home.) I only saw one of the Charles Urban early scientific films – these too had a separate programme. I did see most of the ‘Cinetrain: Russian Winter’ films that were dotted across the main programme. This funded production programme invited international filmmakers to make films about communities in Northern Russia during the ferocious Russian winter. It’s an interesting project with information available on its website. Bradford showed all seven films which attempted to explore “the most common stereotypes about Russia”. These include excessive drinking, open-air bathing in the depths of winter, traditional Russian crafts etc. I was most intrigued by the village dwellers in one community who complained about the disintegration of local community/collectivist spirit. They viewed the new capitalist Russia with mistrust and felt that today people steal from each other to get by when they used to help each other. That’s a side of the new Russia that doesn’t get as much media attention as it should. Other than these separate programmes, each of the ‘official features’ was also accompanied by an appropriate short film. I confess that under pressure with several screenings on the same day I sometimes missed the short on purpose to give myself a few extra minutes of breathing space. I’ll just pick out one other short (some are mentioned alongside the feature screenings). The one that impressed me most (i.e. 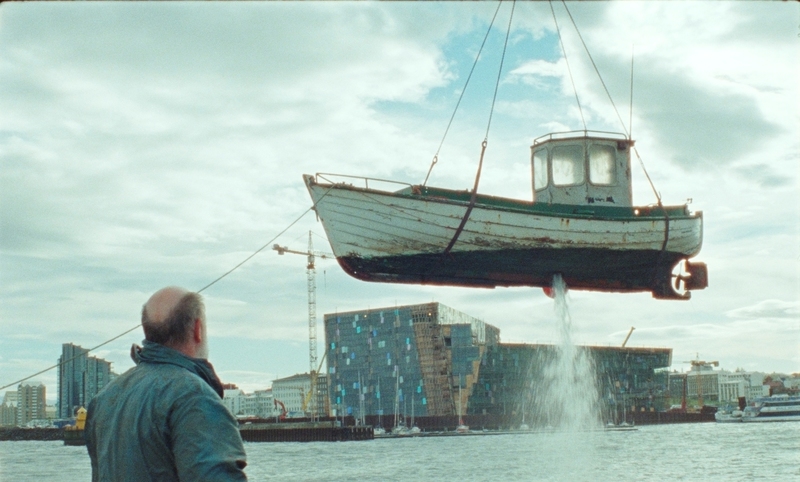 appealed to my interests) was Whale Valley (Iceland-Denmark 2013) directed by Arnar Gudmundsson. This tells a complete and satisfying story about two brothers – a genuine ‘Nordic noir’ – on their farm (see the still above) in 15 minutes of skilled narrative filmmaking. I wasn’t surprised to learn about its success at festivals worldwide. I don’t normally do this, but I watched the film of Jar City just days after finishing reading the book. This was preparation for an introduction to the film as an example of literary adaptation – something I’ve blogged on before. A little background. Icelandic writer Arnaldur Indridason has produced a series of crime novels featuring Inspector Erlendur. The books have been extremely popular in Iceland and the first to be translated into English in 2004 carried the Icelandic title Myrin. In the UK it was published as Jar City. Ironically, the filmic adaptation is officially called Myrin – Jar City on the title-card for the BBFC certificate, but the novel has been re-published as Tainted Blood. Go figure, as the Americans say. I think ‘Myrin’ means ‘marsh’ in Icelandic and here it refers to an area in Reykjavik where a building houses a large number of medical specimens in glass jars. Thus ‘Jar City’. As an adaptation, the film is interesting in terms of the decisions taken over narrative structure, characters and presentation. I don’t want to spoil either the film or the book, so suffice to say, the film drops a sub-plot of no real narrative importance except to flesh out the story about Erlendur and his daughter Eva Lind and also re-orders events a little. The result in my view makes the film less of a procedural investigation and possibly a more familiar form of filmic narrative. I’m fine with this. I enjoy the slower pace of the procedural, but I recognise that it may not be something for a mainstream audience. It also goes with what I think is quite a clever attempt to make Erlendur a slightly more conventional investigator. (The novels portray a much more dishevelled, older man who forgets to eat properly and rarely has clean clothes – Ingvar (above) is quite striking without the heavy glasses and has a natty line in cardigans and parkas.) However, this ‘softening’ is a matter of degree. The filmmakers have kept Erlendur’s junior partners much as described in the books (the two I’ve read so far). Sigurdur Oli is suitably Americanised and bumptious, while his female colleague Elinborg is happily an ‘ordinary’ and quite sensible woman. I confess that I had no real idea what she would look like, so the joke’s on me if I expected someone more glamorous. 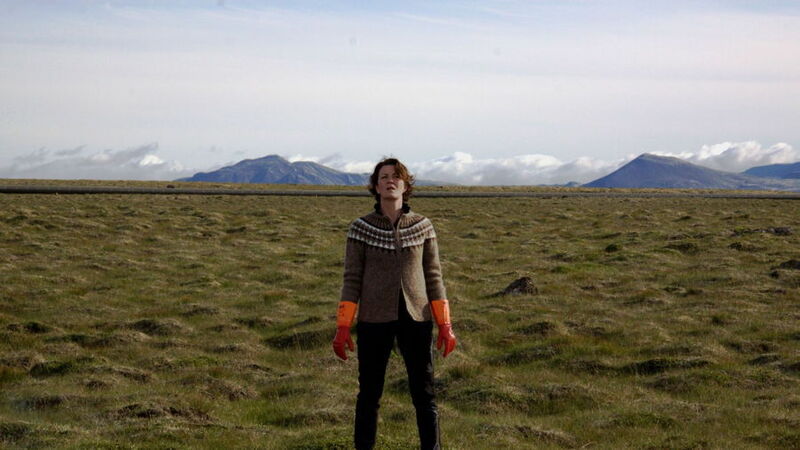 Of course, outside Iceland this won’t be treated as a mainstream film, except perhaps in other ‘Nordic’ countries. Iceland itself has perhaps the highest cinema attendance per head of any country in Europe – perhaps in the world – so perhaps I shouldn’t expect anything other than a ciné literate film from Baltasar Kormakur, the director of 101 Reykjavik, the only other Icelandic film I think I’ve seen. That seemed quite hedonistic by comparison. In style terms, it’s noticeable that Jar City uses a CinemaScope frame, filling it with quite a few long shots of bare landscape and modern housing/offices, sometimes aerial shots and mostly cast in bluish/greenish light. I’ve not been to Iceland, but I could feel the cold and the wet. I could also smell it since this story rather overdoses on the olfactory. The other style feature is the use of music, at times quite obtrusive and sometimes using choral voices. I fear that to those outside Iceland, the music probably simply conveys a sense of Nordic solemnity – I couldn’t find out much about it, not even from the minimal press notes. This was one part of the film I didn’t understand. The opening and closing images feature close-ups of men in uniform singing outdoors as if in a choir on parade. The closing shots reveal that Erlendur is amongst them – so presumably it is a police choir or some form of ceremony at which the police are on parade. I have got some ideas, but I don’t want to spoil the film. If anyone can give me a clue that isn’t a spoiler, I’d be grateful. It’s an interesting element since the other Indridason book I’ve read focuses on a child who is a choral superstar, so it clearly has resonance for the local audience. Back to the adaptation question. The film is, I think, more conventional in the way it presents the criminal activity that Erlendur investigates. There is little time to consider the serious ethical and sociological/political issues that the story raises. In the book, because Erlendur and the team struggle to get leads, it actually became more gripping. On the other hand, the realism of the film gives a much better sense of what Iceland might actually be like and what being a police officer in a country of only 320,000 must be like. As a vegetarian who lives in a sheep-rearing region, I’m still flashing back to the sight of Erlendur tucking into a boiled sheep’s head that he buys from a drive-thru. There is also a funny anti-vegetarian joke, but at least it’s at the expense of Sigurdur Oli. As far as I can see, the collection of samples in Jar City and the associated research is a national issue since Iceland’s small population – sometimes considered the most developed society in the world – is the first to be properly classifiable as a genetic population. This raises quite a few potential questions. The other important theme is the contrast between ‘new’ and ‘old’ Iceland. The director has said that this is what attracted him to the character of Erlendur, who embodies many of the values of ‘old’ Iceland. His daughter represents ‘new’ Iceland – which does seem to have problems. I’d recommend the film and the book.